I suppose this is an insensitive title for a post given how many wild storms are raging around the planet at the moment. It's rather nice having so little to blog about lately after the intensity of last year! I have a bunch of posts in the pipeline but I'm taking my time finishing them in between catching up on missed anime and playing a weird mixture of Sengoku Basara 4 and Diabolik Lovers ~Haunted Dark Bridal~. Still, I guess I'd better keep up on the news in preparation for Capcom to unleash the next wave of hype as the announcement about the upcoming anime is getting closer. This post is mostly about new Sengoku Basara 4 merchandise. A set of quirky Sengoku Basara 4 wall stickers are to be released on 27th March 2014 for ¥1,000 each. There will be three different packs to collect: Date Masamune Cavalry, Ishida Mitsunari & Shima Sakon: Battle Comrades and Footsoldier Formation. Fans of characters other than the four main 'poster boys' of the latest game can finally organise their paperwork with some new faces on 24th April 2014. The files cost ¥350 each and will be available in four different designs: Sanada Yukimura, Tokugawa Ieyasu, Chousokabe Motochika and Mouri Motonari. 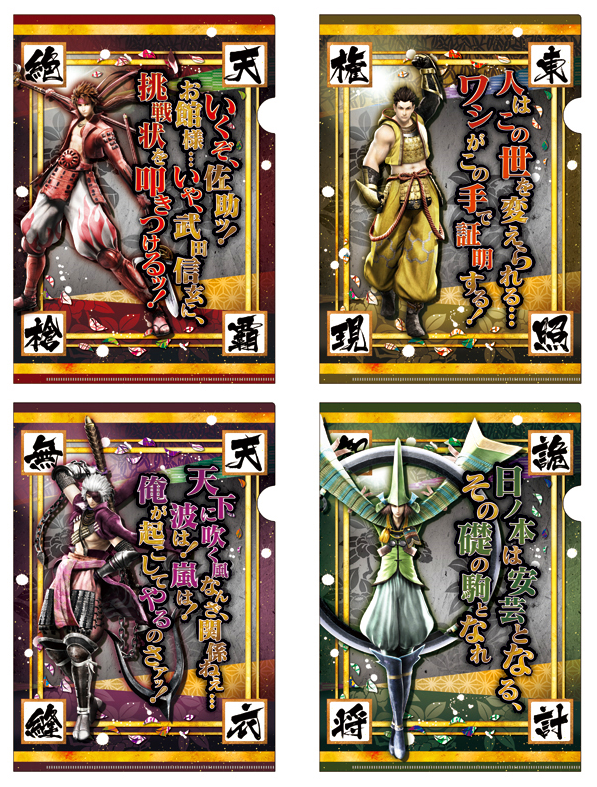 If those four characters aren't your favourites, there's another set of sixteen smaller A5 files on the way too with the Sengoku Basara 4 Bushou Clear File Collection Box being released on 27th March 2014 for ¥3,200. I have no idea what the secret file design will be this time - a group picture? We can also look forward to the upcoming Sengoku Basara Magazine CD: Showgeki Basara Talk! Vol. 2: Yukimura & Sasuke No Maki Special-ban CD, now dated for 20th March 2014. 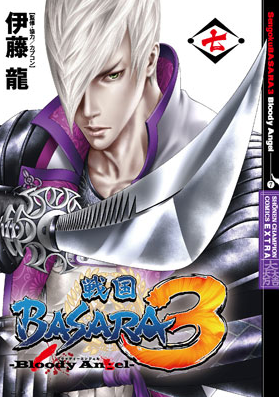 It will collect content from the two CDs packed with Sengoku Basara Magazine issues three and four as well as brand new material. The Basara Challenge skits that Yukimura and Sasuke will perform are hide-and-seek, a crane game and a new 'hot-blooded tenacious sporting drama', which sounds suitably exciting. As an additional bonus, special guest Okamoto Nobuhiko (Shibata Katsuie) will be joining fellow seiyuu Hoshi Souichirou (Sanada Yukimura) and Koyasu Takehito (Sarutobi Sasuke) for some of the content. The cover artwork is a temporary placeholder; expect a brand new picture for the real cover to go with the content on the disc. 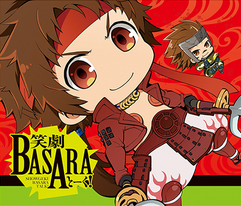 In addition to the new CD, the original Sengoku Basara Magazine CD: Showgeki Basara Talk! Vol. 1: Masamune & Kojuurou No Maki Special-ban CD from September 2013 will be receiving yet another print run to meet demand. The CDs are both priced at ¥2,625 each. Fans who missed the bonus CDs which came with the various Visual & Sound Book volumes released for Sengoku Basara 2 and Sengoku Basara 3 can now order a special compilation CD including all four audio drama tracks and one of the cast talks with Ookawa Tooru (Tokugawa Ieyasu) and Seki Tomokazu (Ishida Mitsunari). It will be priced at ¥2,625 and the release date is 20th March 2014, though visitors to the Game No Dengeki Kanshasai 2014 & Dengeki Bunko Haru No Saiten 2014 event on 16th March will be able to pick up their copies early. The cover artwork is just a placeholder image at the moment. If you're curious about the content, my old reviews for the books mention the CDs as well. A large number of characters appear over the course of the tracks so most fans should be reasonably satisfied! Mitsunari fans might enjoy the newest cover artwork for Itou Ryuu's ongoing manga series. I think it's the best one yet. The manga will be released on 7th March 2014 as previously planned. Those still unsure how the gameplay actually works in Sengoku Basara 4 can check out the new video highlighting battle comrade combinations and showing off how intense the game's action can be if you're a better player than I am. Shima Sakon fans have also been treated to a video showing footage from Sengoku Creation mode to go with the previous Naotora and Masamune clips.